My heart grieves for the thousands of victims in this tragedy. But somehow also for the WTC itself. 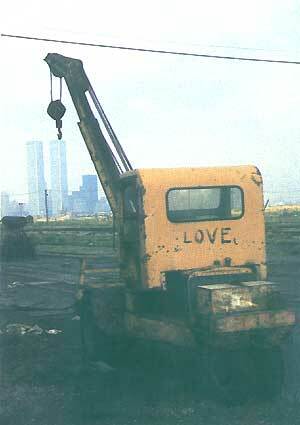 I witnessed the construction of the WTC in 1973 - and must have felt it needed a lot of love when I took this photo from New Jersey. The buildings always greeted me with a warm thrilling sensation from this angle when I came "home" to New York after long trips in the South - first as a hitchhiker, since as a campus lecturer. 20 years later - in 1993 - friendly Arabs rented the space next to mine in my storage space in Jersey City, where I store my photo equipment. Having sometimes talked to them, I was naturally in deep chock when I learned they had mixed the nitrate bomb with which they blew up the WTC right next to my room. I had to cancel several lectures while the FBI sealed off the building to prevent the left over material from detonating the whole area. 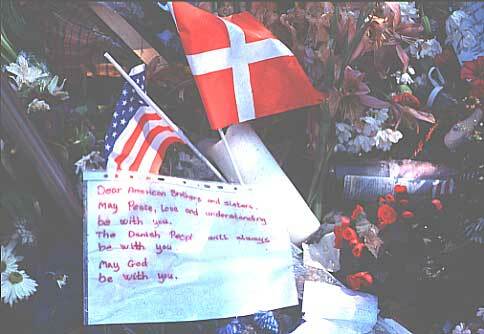 I wrote more about that in my Christmas letter that year (in Danish). 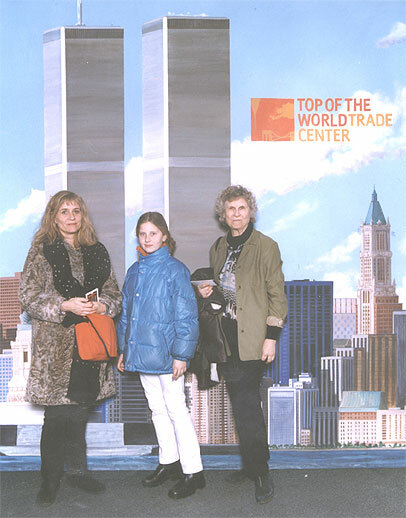 During my spring tour this year my wife Vibeke, my daughter Lalou and my mother-in-law Sigrid, came over to see me in the US and were visiting the top of the WTC. They usually never buy such trivial tourist pictures - captured by an automatic camera. So in the days after the catastrophe it was strange to have a picture which in such short time had become historic. My own farewell to the WTC was also recorded. 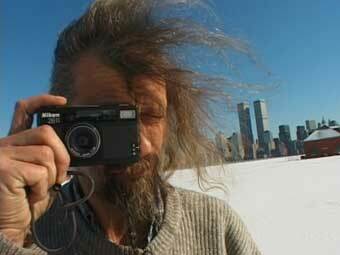 Two Danish photographers, who were making a movie about my life in America, photographed me with the WTC in the background and driving toward it. In another shot they panned from the WTC down to me as I stepped out of J & R Music World into a taxi with my new computer - the laptop which I am right now making this web page on during one of my slideshows in a Danish school - unable to focus on anything but the WTC these days. I worried about Christina's safety for 3 days after the attack until her own email account of the tragedy finally reached me in Africa. 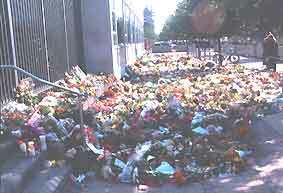 When I came back to Denmark, my daughter and thousands of other school children had spread flowers and home made art pieces on the pavement in front of the American embassy. It was strange. I had never in my life seen a PRO-American demonstration there. Text below: "..... the Danish people will always be with you....."
But the tragedy forces us to reflect on what mistakes we have done. Susan Sontag's wise words in The New Yorker are being circulated widely in Denmark and Germany as is Edward Said's comments on WTC, Dalai Lama's Dear friends and Madeleine Bunting's Intolerant liberalism. Have we been too busy for too long heaping up personal material wealth ........while a population bomb ticks on the outside? as with this junkie I photographed shooting up on a roof top close to the WTC ? Are we forgetting the anger we cause when we marginalize people both at home or in the Third World ? 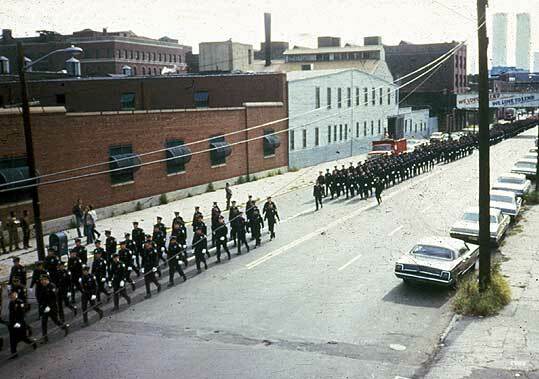 Here I photographed 5000 cops marching through the ghetto in a display of power after a white policeman's murder. 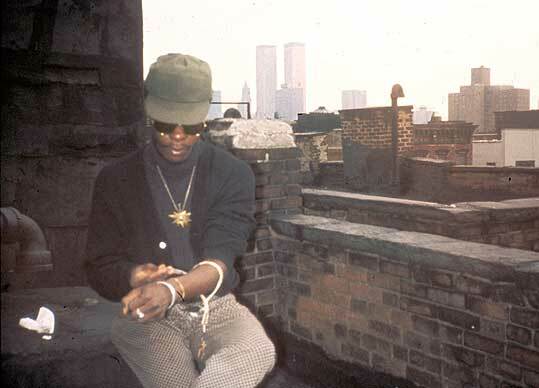 He had been beating a black woman when a young man in hurt and anger shot him down from a roof top close to the WTC seen in the back. I heard about the attack on the car radio of my Land Cruiser in the dessert of Namibia while these bare breasted Himba tribes women lined up to see themselves in my mirrors - perhaps the only mirrors they had ever seen! See more Himba photos here. Perhaps this shocking and contrasting framework explained why I heard almost all Africans say the day after the disaster: "My heart goes out for the innocent American victims..........., but....." Always with this "but" a little later followed by a long list of examples of the betrayal they feel of America towards the world's poor in recent years, the refusal in the midst of unprecedented American prosperity to redistribute some of its wealth, to pay for the UN, to commit towards the common world causes such as the environment (in Rio, Kyoto etc), for withdrawing from the Racism Conference in South Africa, etc. So let us work together to help avoid that we now build up a FORTRESS AMERICA and a FORTRESS EUROPE which in the long run would be doomed to failure as the vulnerable WTC showed: - costly missile shields will perhaps protect us from terrorist missiles, but never from the population bomb of world poverty. We all feel quite powerless now. 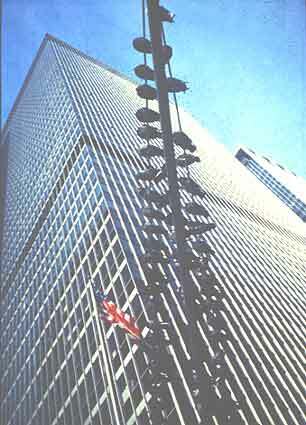 In my own powerlessness I decided to share my own fond memories and photos of the WTC with you. Please note: This page was entirely made for my personal American friends and came about because Mog Decarnin couldn't download the personal WTC-photos I e-mailed to some of you. 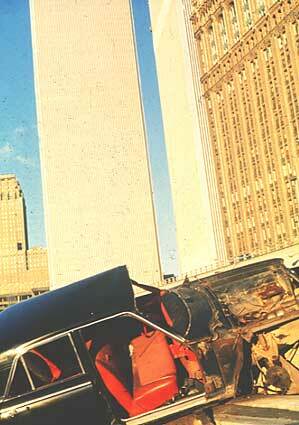 So it is basically about my own "photographic" relationship to the WTC as a dear building. An actual tribute to the victims is shown in the top black box and is borrowed from Jessica White's beautiful Memorial Page.